The episode that helped inspire Dirk Gently's Holistic Detective Agency was never filmed, but it's being adapted into a new book by the BBC. It's not common knowledge, but Douglas Adams -the man who created The Hitchhiker's Guide to the Galaxy- wrote a couple of Doctor Who episodes back in the 1970s. However, it turns out that Adams wrote a third episode that was never completed, but it now turns out that the episode is going to be published as a novel by BBC Books next year. The episode, "Shada" was originally supposed to air back in 1980, but was never filmed because of a strike that held up production. After that, new producer John Nathan-Turner asked the BBC for money to finish the episode but was denied. 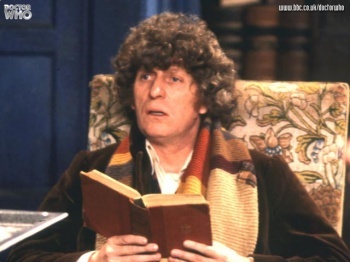 Parts of the eepisode were then included in 1983's "The Five Doctors"; a VHS tape of "Shada" was eventually released, and actor Tom Baker narrated the scenes that hadn't been filmed. An audio version of the episode was released, though Paul McGann took over Baker's acting duties as the Doctor at this point. Adams, meanwhile decided to use several ideas from the episode in his acclaimed novel, Dirk Gently's Holistic Detective Agency. The book version is being written by Gareth Roberts (who has already written some other novels in the Doctor Who universe), the man who recently penned the excellent episode "The Lodger." In "Shada," the Doctor and Romana are summoned to Cambridge University to visit a retired Time Lord, who's living incognito as Professor Chronotis. It turns out Chronotis has kept one very special book that he took from the Time Lords' planet, Gallifrey, and an evil, mind-stealing alien named Skagra wants the book for himself. The book will reveal the location of the prison world Shada, home of Gallifrey's most notorious criminal, Salyavin. It will be interesting to see if Roberts is able to successfully adapt Adams' writing style, which is pretty unique. That said, "The Lodger" was one of my favorite episodes of the most recent Doctor Who season because it was simultaneously bizarre, epic, cute, and (in the end) incredibly heartwarming. Hopefully the novel will do Mr. Adams some posthumous justice.